Well, it seemed like forever since the poor old Tenere has been let off its leash and taken for a decent gravel ride so today was the day to fix that. Yesterday I'd been trying to chase down a slow leak in the front tyre and didn't really get anywhere so after checking it again this morning I decided that I was good to go. I'd posted a note up on FB last night to see if there was anyone else out there interested in a ride and my bait hooked me a Rodney again. We agreed to meet in town and when I got there I discovered that his 650 had magically turned into an 800 - nice! 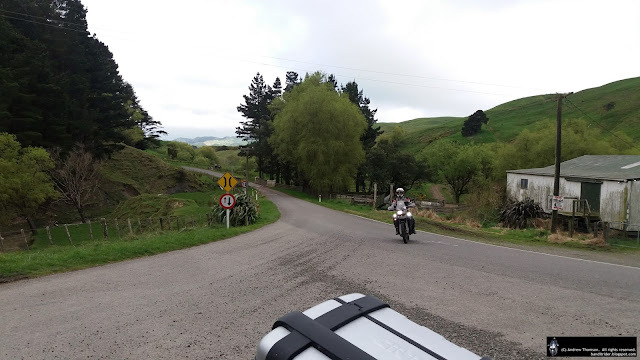 Dropping down the other side of the hill we took Tararua Road for our first taste of gravel and as I was in front I got to chase all the sheep off the roads for Rodney - it is very rare that there are not animals out on this little bit of gravel. 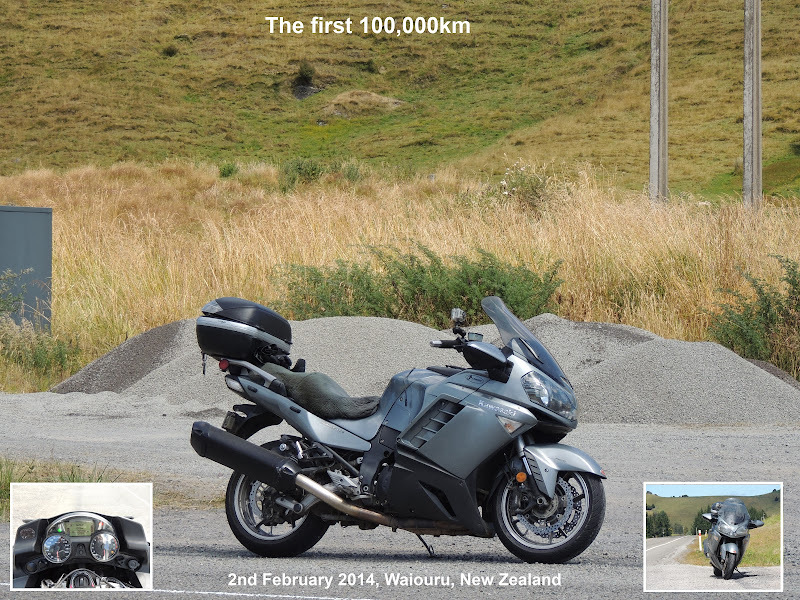 We carried on through to Pahiatua and then turned Eastwards to make our way onto Pahiatua-Pongaroa road. Here we ate up some tarmac before turning off onto Pori road. About halfway down the hill the fog petered out and we got to enjoy some pretty nice gravel before getting spat out on Route 52. 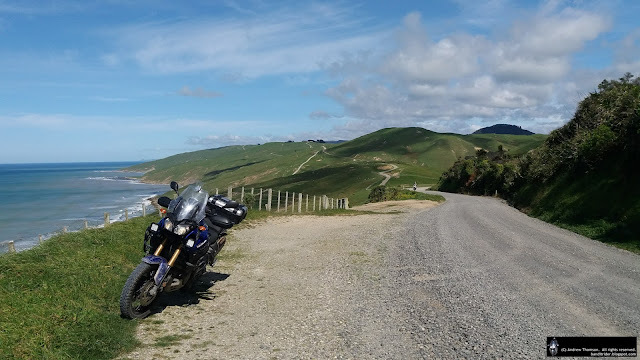 Turning Northeasterly we rode up through Tiraumea, riding around the new roadworks which skirt the slip that took away the road a few months ago, until we got to the next turn-off at Waihoki Valley Road. 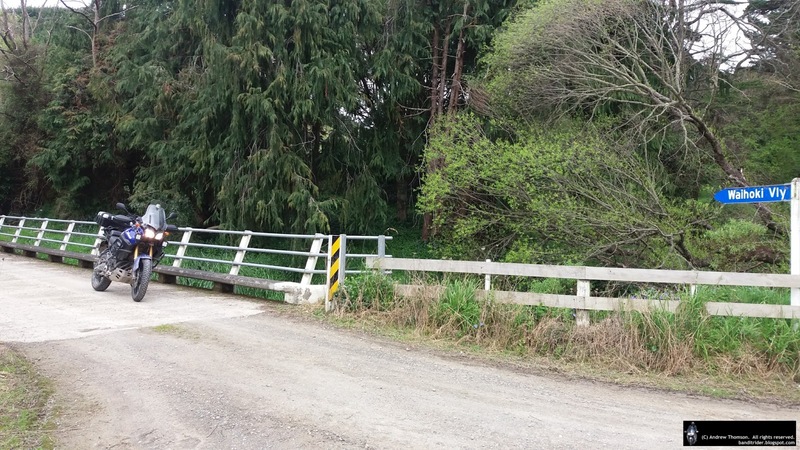 Waihoki Valley Road ends right after the above bridge and forces you to go either left or right on Huia Road. Right was our pick as it was taking us further towards the coast and into better and better weather. Further on up the line Huia Road completely gives up the ghost as it becomes Waiowaka Road but we skipped this by taking a left onto Spur Road. This little road has been a bit messy in the past but today it looked like someone had been through reasonably recently with either a grader or perhaps dropping some gravel. It is a cracker of a road though and takes you up through some nice country before dropping back down the other side and taking you to yet another junction. 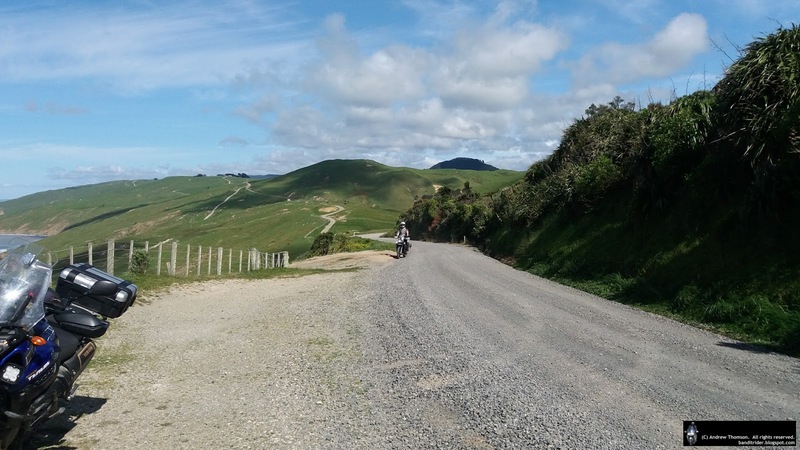 Another left onto Marainanga Road and things start to open up a bit more with faster gravel and less of the steep tight turns. A final right turn got us onto the fabulous Coast Road which funnily enough takes us all the way out to the coast and the settlement of Akitio. Coast Road is always fun and generally really hard, smooth gravel but today there was a short section of recently laid gravel which did slow things down for a little while. Luckily, the truck driver ran out of gravel and there was still plenty of fun to be had on the way to the beach. By now it was nearly half past lunchtime so we went out and checked the store to find that yes, it was closed on Sunday's. Oh, my poor starving worms...There was nothing for it but to carry on up the road and see where it lead us. Glenora and Esdaile Roads made up our next stretch of gravel and got us back out onto Route 52 again just West of Wimbledon. I missed a turn which would have used another gravel road to bypass Wimbledon so pulled up next to the pub to let Rodney know. We decided that rather than stopping there for lunch we would drop into Herbertville and check out the offerings there. 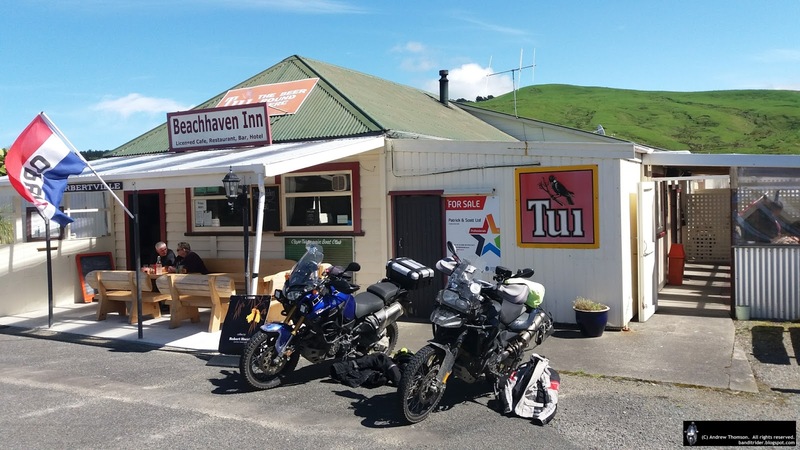 As it turned out there was plenty on offer for the famished Adv rider but a simple fix of fish and chips sorted out us out and prepared us for the next leg of the ride. We removed a layer or two, remounted and retraced our steps back towards Wimbledon but instead of heading West we went North on Route 52 until our next turn at Birch Road. Birch Road winds its way through a forestry block and can get a little muddy after rain. We've had a lot of rain...But, a grader has been at work and a lot of the muddy spots had been smoothed out with a layer of metal. Logging trucks have then been through and squished small ruts into this mud/gravel/porridge and the odd spot was a little interesting...it was similar to hitting soft sand. 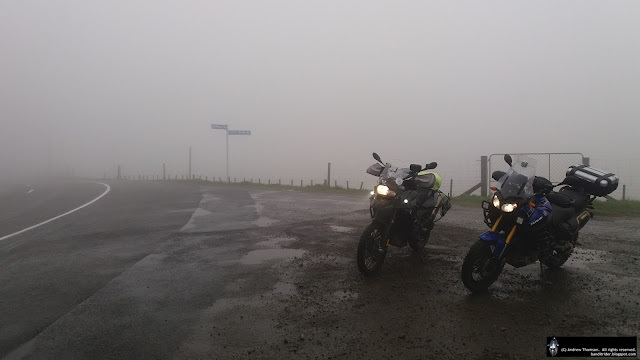 In the open spots there was a bit of wind to bash us around a bit but it was still better than the fog on Pori Road. 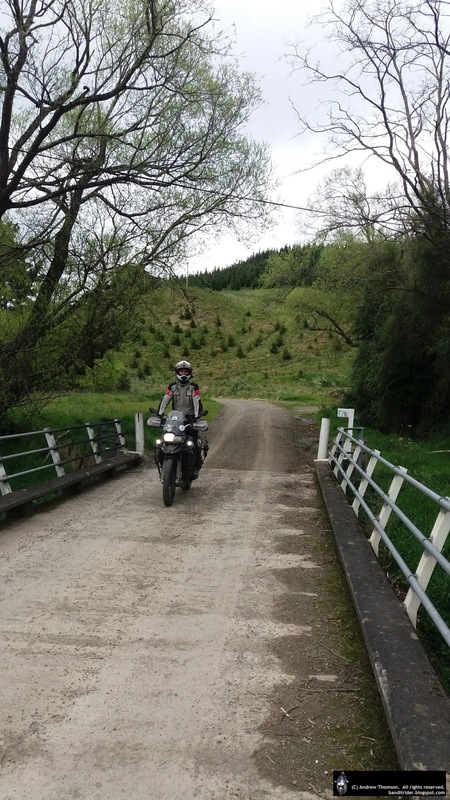 Our last bit of gravel took us down Tahuokaretu and you guessed it, back onto Route 52. With a few spits in the air it was now time to head home and hopefully not get a drowning. We made Dannevirke without getting wet and after topping up the Beemers tank, made our way by various (sealed) back roads and a busy Saddle Road (they've given up on the gorge) to Ashhurst and then finally Palmy. Ahhh, but it was nice to be out on a decent ride for a change! 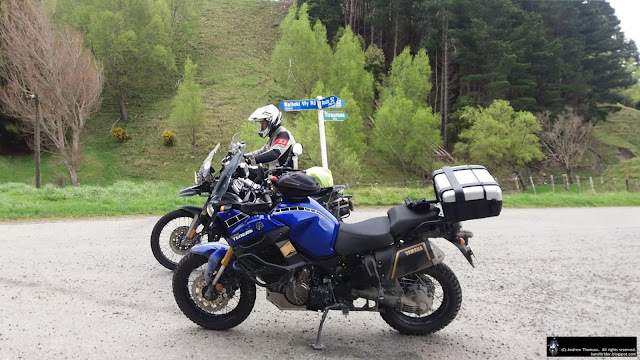 While I may be getting old (although I don't appear to be catching up to a certain Ashhurst Connie pilot), I am also getting used to the comfort of the Tenere's riding position. It is slightly more roomy and also has a more upright riding position. I can't do much about the legroom. There are people out there that have lowered their foot pegs but that is not an option as I have been known to give them the occasional shine up on the road and I do not want to be doing this on every second corner. So that leaves me with playing with the handlebar area. To give me a slightly more upright riding position and to hopefully offer more comfort to my arms, back and shoulders I decided to try a set of bar risers. There were plenty of options on E-Bay and I had a bit of a hunt around before settling on a set of 50mm jobbies. As you can see they came with some longer bolts but I also have my GPS mount bolted to the handle bar mounts so I bought another 4 slightly longer bolts just in case. On my initial attempt at installing I decided that I didn't like how much pressure they were placing on the brake and clutch lines so I found someone with some engineering skill how was able to take 10mm of each riser. Once that was done it was time to fit. This was a pretty simple job and the risers even had a thread tapped into them to allow the repositioning of the brake/clutch lines so that there was enough slack in them. Shaving off that 10mm also meant that I didn't need those flash stainless bolts I bought either. So they're on now and I've only really ridden the bike around 50km with them on so no decent distance to test comfort but I can say that they haven't had any detrimental effect on comfort or handling. 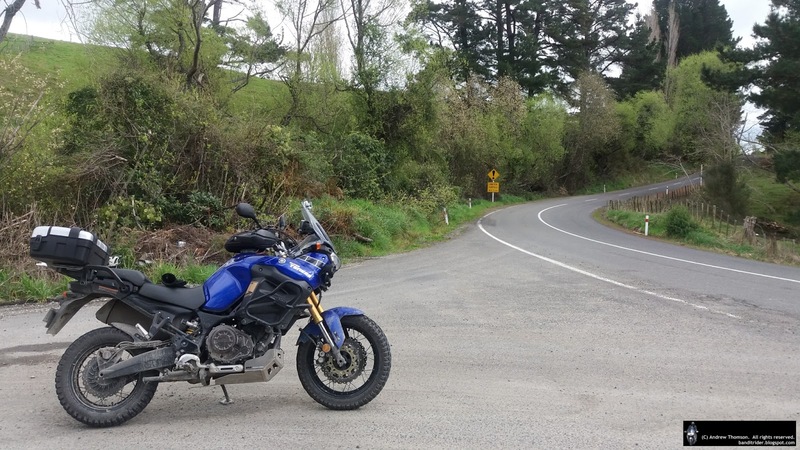 Swapping from the Connie to the Tenere (just with the bikes on their main stands) demonstrated a pretty similar feel with the only really noticeable difference being the width of the bars - the S10 having the wider jobbies. With the Concours just having celebrated a big birthday and it finally due to get some exercise it was time to give it some loving. The first job I completed a week ago and that was easy (having done it a few times), replacing the air filter. I also had intended to dive into the big job of changing the plugs but ran into an issue with a damaged fairing bolt that I couldn't move and didn't want to totally destroy. A trip over to the old man's shed sorted that pretty quickly. And so, on Sunday it was time to start removing tupperware (and a lot of other stuff) to go in search of the plugs. Dad and I had done this job about 60,000km ago and I knew from that experience that it wasn't easy. There is a motor (and what a motor) under all that plastic and other stuff. All sorts of stuff needs to be removed or pulled aside. You cannot just remove the tank (like a lot of bikes) as the airbox is basically built into the frame and the area between the top of the motor and the frame/air box is tiny. When we first did the job we couldn't get any of Dad's spark plug removal tools in anywhere near the plugs and sat around for a while scratching our heads trying to work out how we were going to perform the operation. In the end I decided to check the bike toolkit and low and behold there was a special tool in there which has a joint in it to allow you to get it in under the frame and drop it down the plug hole. It can then be turned by a ratchet and then skinny hand (don't have one of those BTW). I tried to show how little room there is in the pictures below - tricky to get a decent picture. I did 3, 4, 2 and then 1 with 4 being the easiest followed by 1 and 3. Number 2 was definitely the most awkward. Anyway, by lunchtime (I think I started just before 10) I had the plugs in and half of the bike back together. Another half an hour or so in the afternoon had the rest of the bike back together - and yes, I fired her up before putting everything back together just in case I'd made a blue. After buttoning things up I took her for a wee pootle into town to pick up some oil and I reckon she felt like she was enjoying the new plugs. Maintenance not quite finished for the day, the hot oil was dropped out and replaced along with some more fresh oil for the final drive. Something inspirational I stumbled across on Advrider. Good choice of bike - DCT making one thing a little easier. One of the guys at work actually has a cousin in a similar position. He (the cousin in the chair) has modified his own GSX-R750 with a similar system and I've seen him out riding it a few times on the Coast to Coast.